Swinging at The Cotton Club’ is the action-packed show celebrating the music and dance of the Cotton Club – New York’s most celebrated nightclub of the 1920s and ‘30s. Take a step back into 1920s & ’30s New York City and through the doors of Harlem's hottest nightclub, 'The Cotton Club'! ‘Swinging at The Cotton Club’ is the action-packed show celebrating the music and dance of the Cotton Club – New York’s most celebrated nightclub of the 1920s and ‘30s. Performances by Duke Ellington, Louis Armstrong, Cab Calloway, Billie Holiday, Ella Fitzgerald, and Fats Waller would have had the club swinging - whilst dancers such as Bojangles Robinson and the Nicholas Brothers lit-up the stage with their breathtaking routines. 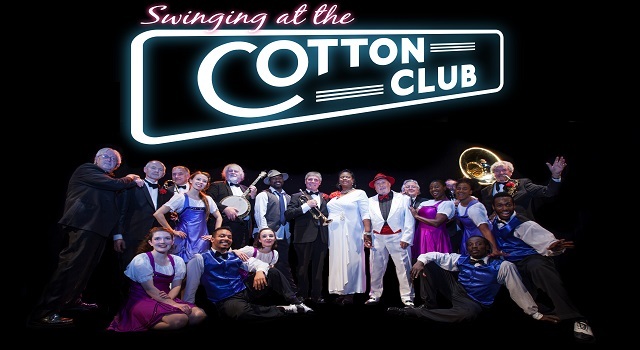 In this show, the exhilarating dance and music of the Cotton Club is recreated by the fabulous Lindy Hop Dance Company, alongside The Harry Strutters Hot Rhythm Orchestra, featuring American vocalist Marlene Hill and compere/vocalist Megs Etherington.